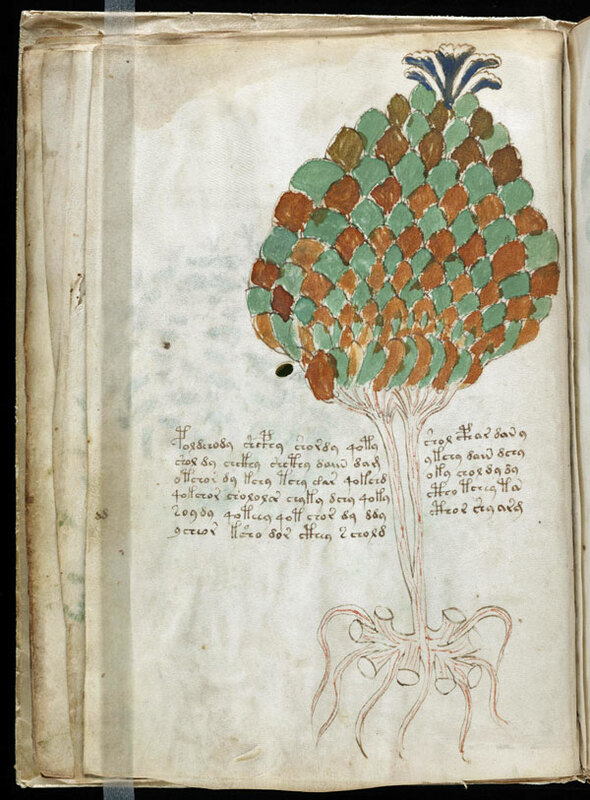 [... continuing where i left off], musing on Beinecke MS 408 got me to thinking more about language & plants. 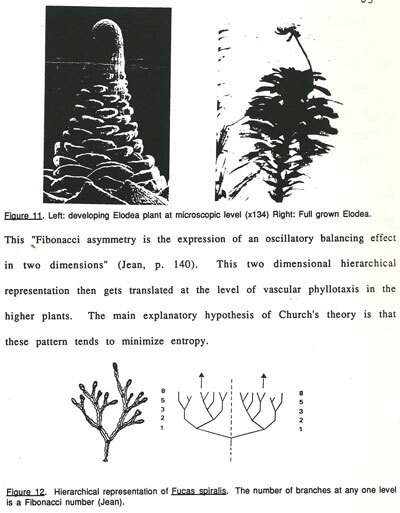 as an undergraduate studying math at UC Santa Cruz i was somewhat obsessed with plant morphology. coincidentally, in the video in the last post, Terrence McKenna said he first learned of Beinecke MS 408 from Ralph Abraham, who was my first choice as senior thesis advisor at UCSC, but alas, he was on sabbatical or not taking on any more students, i forget. 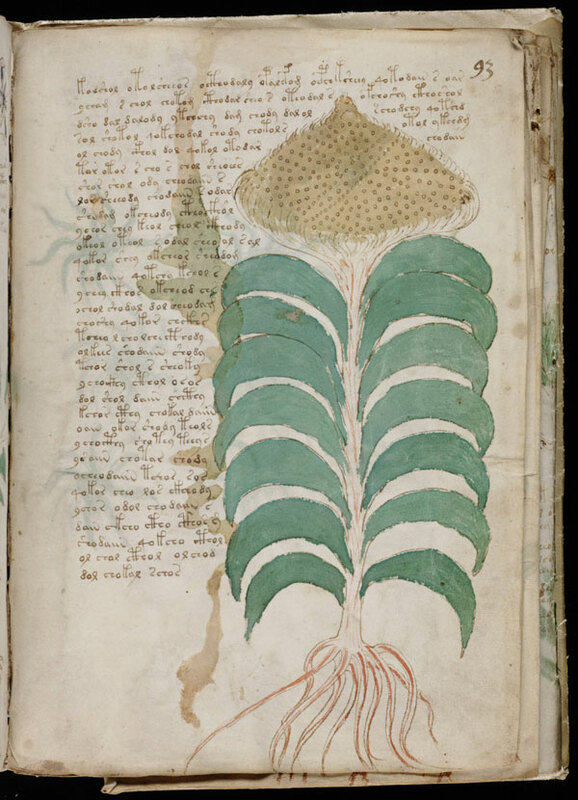 i vaguely remember the so-called Voynich manuscript talked about in hushed tones amongst the computational math geeks, but in those days [late 80s] the internet wasn't that connected so i don't remember actually seeing images/text from it. 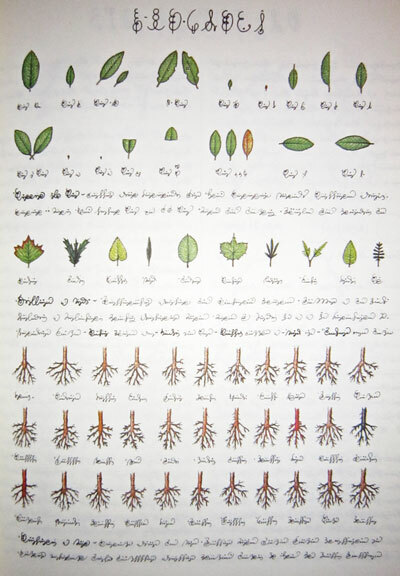 plus i wasn't that interested in breaking code, which seemed to be the brunt of the interest in the so-called Voynich manuscript. it's no secret that the Fibonacci sequence crops up everywhere in plants—if you count the number of petals on a flower, 9 out of 10 times there'll be 5, 8, 13 or 21 petals, but few & far in between will you get non-Fibonacci numbers. & i'm sure everyone's heard that if you count the spirals in a pine cone or aloe or artichoke you get Fibonacci numbers, etc... but i wanted to know why. & strangely when i discovered why it was in some obscure journal [Tony Van Ravenstein «Optimal Spacing of Points on a Circle» Fibonacci Quarterly, Vol 27 no. 1, 18-24 (1989)], wherein he proves that the so-called golden ratio allows for optimal spacing of points along a circle. & since the golden ratio is an approximation to the ratio between successive Fibonacci numbers, having plants that put out leaves using this spiraling arrangement of successive Fibonacci numbers [in opposing direction], leads to optimal spacing of leaves along the stalk of the plant, minimizing overlap of leaves & thus allowing for maximum sunlight & photosynthesis. while this is all in my rear view mirror now & i've shifted gears to language & art, these ideas seem to still inevitably creep in to my work. 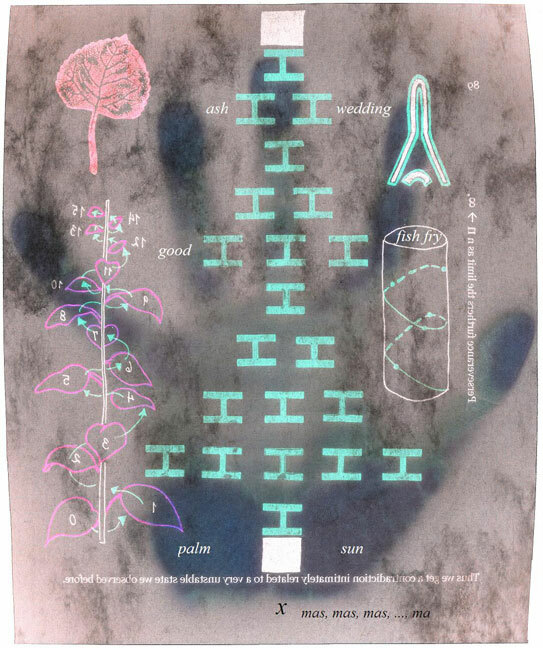 not only does the overall structure of Ark Codex hinge on Fibonacci numbers [144 pages divided into 5 folios, each of successive Fibonacci numbers] but this idea of phyllotaxis & bifurcation keeps creeping in probably in more ways than i even know. 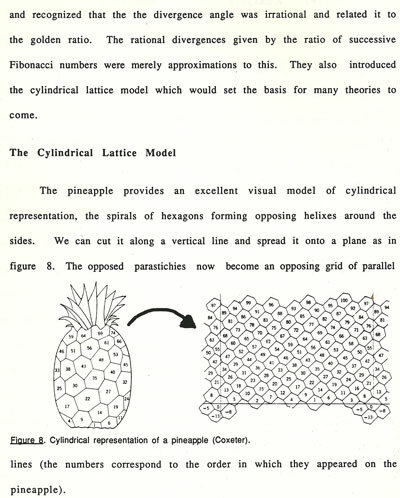 i'm not gonna get into the nitty gritty here, of why plants express Fibonacci numbers in phyllotaxis, there's a mathematical proof in the above linked-to Van Ravenstein paper. 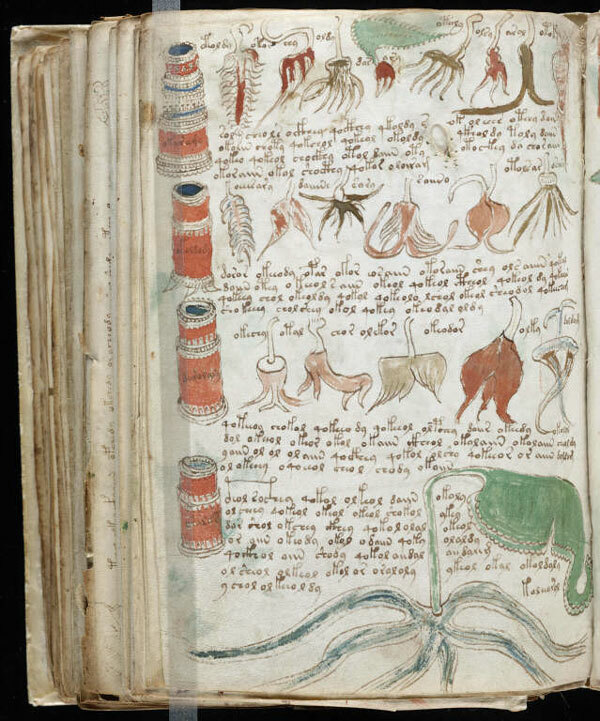 like Beinecke MS 408, i don't think most people care about the real meaning behind it, but are more fascinated by the mystery & strangeness of it all—almost as if knowing the truth kills the intrigue. & discovering a reason or a wizard behind the curtain perhaps gives less of a reason to believe in «god» or magic or whatever unseen mysterious forces people want to believe in. readers will project their own beliefs. when i look at Beinecke it looks like genetic plant code to me & i see lots of 89s & 8s & 2s [Fibonacci numbers]. 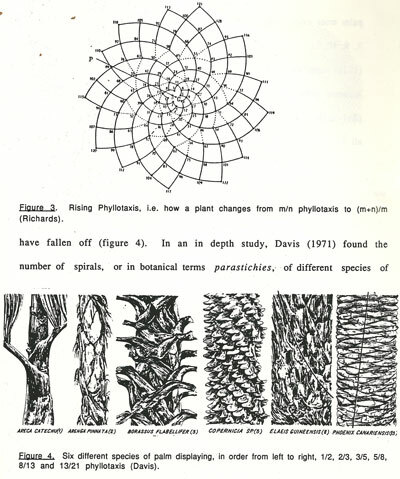 Tony van Ravenstein gave a proof for the reason plants express successive Fibonacci numbers in spiralings, but it still doesn't explain how plants discovered it, or how they implement it. sure it's a simple bi-product of natural selection, the optimization of leaves around a stem to maximize sunlight, but i'm not talking about this underlying reasoning so much as the mathematical & lingual interpretation—the realization in a language for human understanding [this was all that was «discovered» after all]. it's nothing plants need to know. 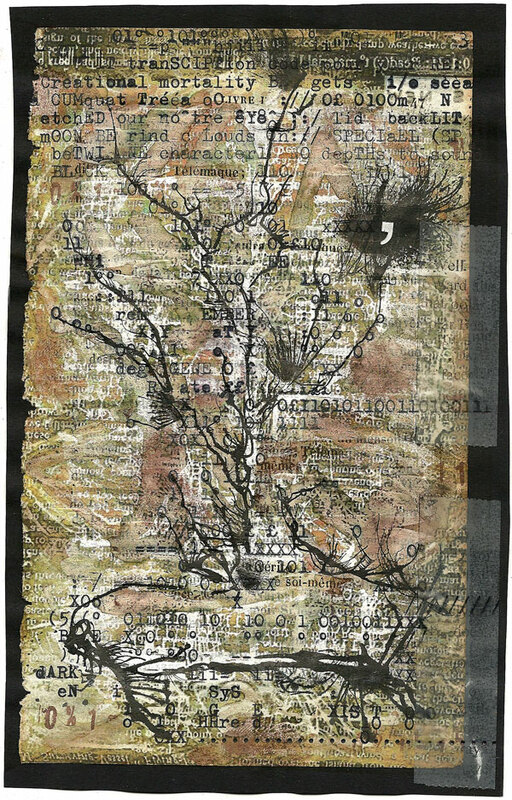 & cycling back to the beginning of the last post—that the purpose of human existence is to fulfill the will of plants—perhaps we are only here to put this into language for the plants. to document it for prosperity's sake. we are possessed by plants to spread their seeds, whether it be agricultural [as Michael Pollan [ironic his name sounds like pollen] tells us], or in the case of the unknown author of Beinecke MS 408, to document the genes/memes of plants into some coded language knowing full well that some day it will get filed away in the Yale University Beinecke Rare Book and Manuscript Library. humans are driven by the pursuit of authorship, publish or perish, but who's driving this ship? plants. 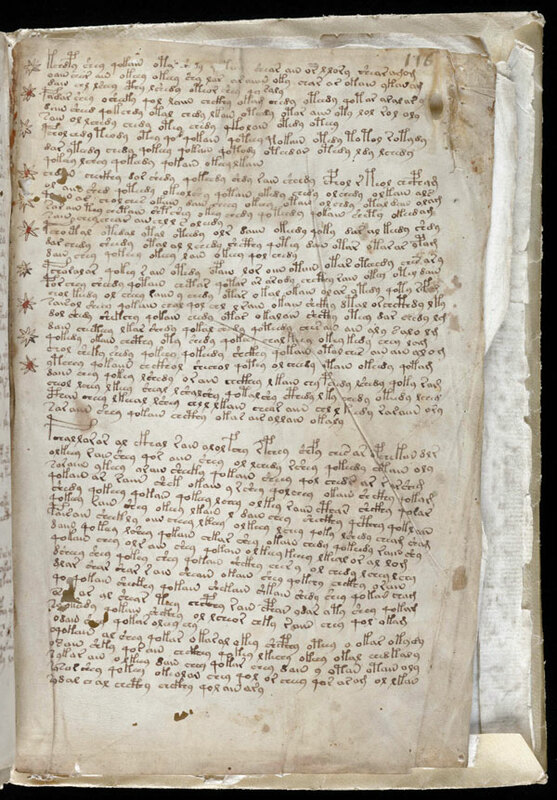 they are true authors in this case [Beinecke MS 408], we are merely ghost writers. these [& pretty much everything i post on 5cense] are things i think about as i work on the Ark Codex. seeing some cool art in Indonesia once i inquired as to the artists & the gallery owners shrugged their shoulders—maybe one person worked on it some, then a few others, it didn't matter. they felt no need to put their names on paintings & this struck me. & when i got some drawings on our recent trip to India it was the same story. of course you could argue that a lack of an «artist» demotes the art to being that of a «craft». but the art is in the eye of the beholder & the only thing being beheld is the art object, so the only «artist» there is once the object is created, is on the receiving end. in the case of science, it's the discovery that matters, not who «discovered» it [or put into language fit for human understanding]. in the case of a book, the published object is all that matters. the information conveyed is at the heart of it. the art is in the presentation, the display. we are merely disposable beings whose biology was driven by the needs of this information to propagate in an artful form. contemporary music is ahead of the other arts in this regard, in the recent trend to have «projects», a person, or people that get together to make an album or a song & then perhaps regroup into something else, so what becomes important is the project, not the people behind it. & regardless, both are façades, scaffolding that crumbles away when finished. at the end of the day all that's left is the song. artists die, but the songs remain the same. artichoke season [speaking of opposing Fibonacci spirals] is in full-swing here in Rome. when i was living in Santa Cruz i was a stone's throw from Castroville, the self-proclaimed artichoke «center of the world» & i thought i'd had good artichokes then. 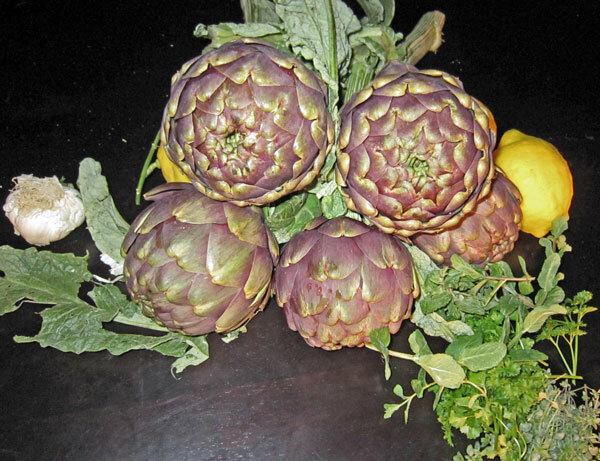 but you haven't had an artichoke until you've had a Roman artichoke when they are in season. 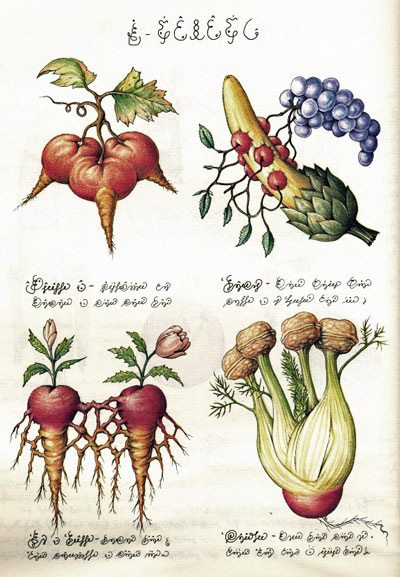 they make them two ways here, the Jewish way [carciofi alla giudia] & the Roman way [carciofi alla romana]. the way they make them just across the bridge in the Jewish ghetto is okay, but it's essentially deep-fried & let's face it you can deep-fry anything & it would taste good. the roman way is boiled, typically with mint & olive oil. the problem with getting them in restaurants is that a lot of times they prepare them in advance [probably because they take so long to cook] & serve them cold. the best ones i've had are the ones we've made ourselves, but that's probably just because we haven't found the right restaurant [though i do remember liking them at La Campana when we visited Rome almost 10 years ago, but we've been back since & haven't been so impressed... maybe because we've been spoiled]. 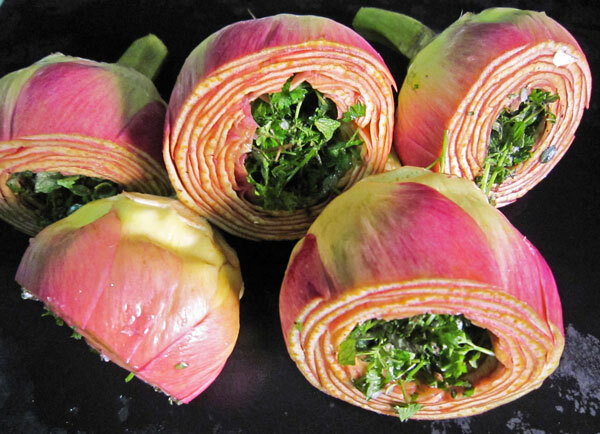 when it comes down it, the most important thing is the quality of the artichokes. i get ours from my favorite hawker [Bruno] at the Trastevere farmer's market. the first time we made them the «roman way» we loosely followed Mario Batali's recipe [with far less oil then he uses & i put lemon in the water they boil in [you also put lemon on them whilst shucking to prevent them from getting discolored]]. the hard part is the shucking—no matter how you slice it it's a lot of work & there's a lot of leaves wasted. even though they don't taste «minty» i think the mint is important in releasing the artichokey taste. 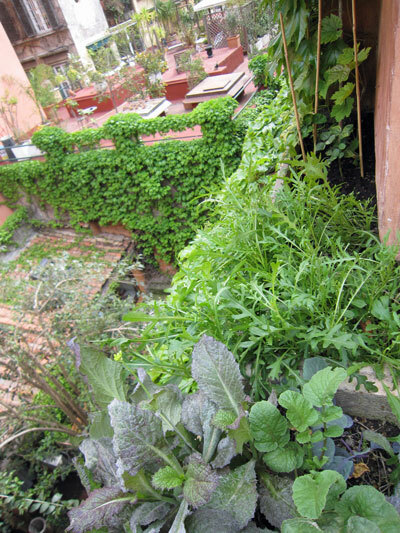 we get our mint fresh from our terrace garden, along with fresh parsley & oregano. our lemons aren't quite ripe yet, but soon we'll have those too. here's what they look like shucked, with the choke removed & stuffed with spiced concoction. i probably leave more of the fibrous leaves on than your average roman, but i hate wasting them, even for compost. [if you're wondering what happens to the leaves when artichokes are jarred for the hearts, i asked once in Castroville & they supposedly feed them to cattle]. the stems are also delicious [the «heart» in my opinion is the first inch of stem] & i'll leave a few inches, or even cut off a few more inches beyond that & throw them into the pot. the other thing that's crucial i think, much as i prefer red wine to white wine, is that you have to drink white wine with artichokes—not that i'm a wine snob, normally i don't care, but fish & artichokes are the two things that taste funny to me with red wine. another tip, if you're having pasta with your chokes, is to re-use the oily broth the artichokes boiled in to flavor the pasta [undercook the pasta, strain, then put back for the last few minutes in some of the artichoke broth, then sprinkle liberally with pecorino romano...]. something the Rocket Man said that stuck with me is that in all these efforts to preserve seeds, not a lot of effort is being made to gather the information on how to actually grow & prepare these plants. when j was in St. Petersburg a few weeks ago she was hanging out with some of the supporting «seed-hunters» in this documentary. while most of these seed-hunters have the biodioversified presence of mind to consider the entire ecosystems, to think holistically beyond just the seeds, i'm not so sure about the intentions of the main bloke who made this documentary: Dr. Ken Street, the self-made Indiana Jones of the seed-hunters, the type that pillages exotic & remote communities at all costs to save seeds from extinction, «green gold» as he calls them. but what's the point of «saving» all these seeds if you aren't working with the farmers & food workers that work with & live off these plants? the «custodians of knowledge» as the Rocket Man calls them. agriculture is more than just seeds—its the whole culture revolving around them, botanical & human, from «farm to fork» as the saying goes.